This research investigates how customers process delightful consumption experiences and, more specifically, whether consumers use intuitive System 1 processing or analytical System 2 processing. Furthermore, we investigate how this affects the magnitude of customer delight and behavioral intentions and whether this effect is moderated by the type of consumption setting, i.e., hedonic versus utilitarian. It is hypothesized that (1) customer delight can result from both System 1 and System 2 processing; (2) that System 2 processing has a stronger positive effect on customer delight and, in turn, behavioral intentions; and (3) that this effect is stronger in a hedonic consumption setting. The conceptual model and hypotheses will be tested in a 2 (processing: System 1 versus System 2) × 2 (consumption setting: hedonic versus utilitarian) experimental design. 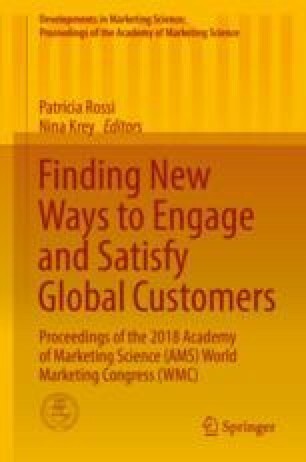 This research aims to contribute to customer delight literature by looking at this marketing construct through the lens of psychology. It will thus explain “how” customer delight works, i.e., its underlying, intrinsic processes. It aims to offer managerial implications by showing which processing system leads to the strongest customer delight and, in turn, strongest behavioral intentions.